Sightseeing tours or special organizations like proposals, birthdays, anniversaries, and whatever else you can think of, whatever you dream of let us do all the work for you. A special day that will never be forgotten is waiting for you! 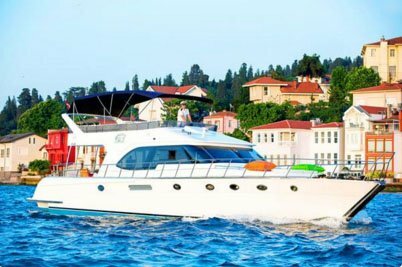 You can do a beautiful sightseeing all the way from the deep blue waters of Bosporus to Istanbul’s emerald green forests, or you can just wait for the night and witness all the amazing light shows on a Bosporus dinner cruise. 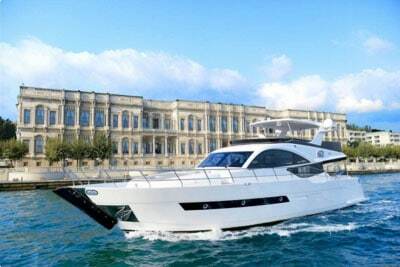 Discover Bosphorus with your luxury private yacht. Istanbul Islands are just like fantastic cities from fairy tales. Imagine that you are witnessing all this beauty on your private yacht. You get to decide when you want to go and where you want to be. You will have the opportunity to discover uncharted coves that can only be reached by your private yacht. Imagine how special a proposal could be if you were able to ask the person of your dreams for their hand in marriage whilst on a luxury private yacht cruise in the middle of Bosphorus during your special, romantic holiday to Istanbul? Take your adventure to the next level with one of our luxury private yachts! 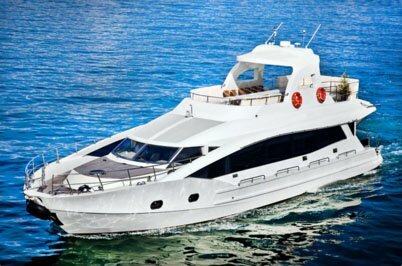 You can rent one of these amazing yachts for private Bosphorus cruises in Istanbul. Cruises are completely private and you have the freedom to plan your personalized experience from start to finish. You determine the duration, time of day, disembarkation point and our dedicated staff is here to fulfill your needs. Our private yachts are far more convenient and enjoyable than public cruises because you don’t have to deal with other tourists or stay on a crowded cruise. Bring your friends, family and closest loved ones to make your yacht trip a truly memorable experience. Our yachts are perfect for private parties, family tours, and romantic getaways. Get the privacy you need and the peace of mind you deserve. Your safety is our #1 priority and all of our yachts are fully compliant with all safety regulations and legal requirements. Plus, we are a legally registered Tourism company and our standard of excellence speaks for itself. Discover the true beauty and breathtaking views up close and personal on one of our private luxury yachts. Transform your vacation into a spectacular experience that will last a lifetime! Contact us today to learn more and book a reservation. There is no middleman. Book the best yachts with the best prices. We work with worlds biggest companies and celebrities. All of our crew is licensed and hired after extensive tests. We are registered under Turkish Ministry of Tourism. You will know exactly how much you will pay. It’s allways easy to communicate with us.